I wish all my readers a happy Sri Krishna Janmashtami. Read more about this festival and how we celebrate at my old post about Janmashtami. This being my all time favorite festival, I thought of making at least one dish that is always associated with this festival at my home. Layyi/layya(Konkani) or araLu/hodlu(Kannada) is a kind of unsalted popcorn. Two types of popcorn are usually available. One variety is made from corn and the other one is made from rice(well, I can’t call these popcorns because they are not popped corns, but they look similar to the corn versions). The rice variety is readily available at my native. 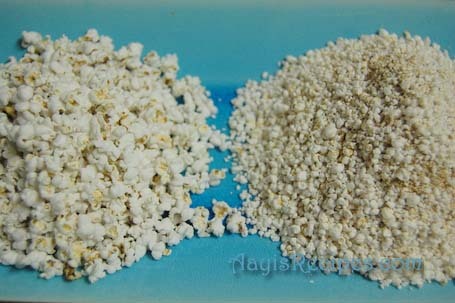 The coarse powder of these popcorns can also be found ready made in market. But here I got the corn ones and I ground them to a coarse powder. Layya(popcorn) piTTo(powder) is one of the offerings – prasad, made on the Janmashtami at my home. My aayi makes it in a big batch and this is distributed among neighbors and servants the next day. The coarse powder of popcorn is sweetened with molasses (paTTal gooD – the black colored liquid jaggery) or normal jaggery, fresh scraped coconut and a big dollop of ghee. Whoever offers this to god, puts 1-2 leaves of tulsi – holy basil into it, signifying god has accepted the offering. 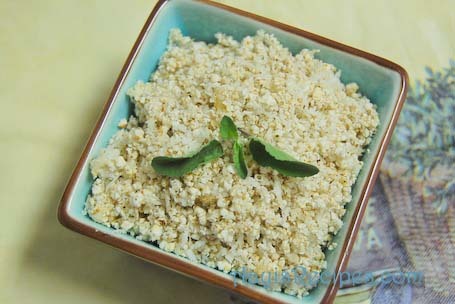 The whole procedure takes this simple dish into a amazingly tasty sweet which is hard to resist. Here I make this dish once in a week or so, since both my husband and I are absolute fans of this dish. I usually serve it for evening snack, after we return from office with a hungry stomach but in no mood to cook some elaborate dishes and eat. Coarsely powder the unsalted popcorn. Mix jaggery and coconut well using your hand. Now add ghee, popcorn powder and cardamom powder. Mix very well with hand. Serve. that sounds good. I am having janmashtami pooja at home today. I will definitely make this. Lovely substitute for Lhaiye pitto! At my place, lhaiye pittya undo is made mixing chuna(coco+goda), cardamom pwdr,honey and tupa (just bit of latter two ingr) and undo kornu, naivedya dakkonu, tulsi pallo ghalunu neighboursanka vantuchey rivaaz. Tks for refreshing my old memories..indeed its a sweet festival..Dahi Kala/Handi being my fave. Thks for posting Shilpa. WISH U A VERY HAPPY JANMASHTAMI! pls chk this link for home remedies. that is one quick and easy one..
shilpa you can make godda panchakdayi also very very quickly. all u need is a little scraped coconut [ soyi], jaggery[ god ] a little ghee and coarse powder of roasted chana [ futanya dali which we put in chivda]. mix it well and heat just c that jeggery dissolves . and in 2 mts it is ready to eat. i add a bit of roasted seasame seeds too . Shilpa: Kanchan, that recipe is already there on the blog(if you click the Janmashtami link that I have mentioned in the above post). Thanks anyway. Your recipes remind me of all my childhood days. I guess karwar n goa has almost same rituals. So in a way, this is your own fast food. Nice to learn about these new dishes. for the layyepitto or lhayi, you can add coconut, alle, green chilli& salt dhadanu churna and prepare theek laaye pitto. After having too many sweets, this tastes wonderful! In karkal, one of the temples, after the continuous godu phovu poojas, on the day of okkul(holi) they prepare theek phovu/lhayi which is known as kalle phovu/lhayi. Shilpa: Sabitha, Yes, we do make this version. It tastes great, I will do a post about it sometime. I was wondering if there is a blog that is specific to Indian recipes but to be cooked outside India. You know what I mean: e.g. how to make besan ladu in USA using local ingredients. Shilpa: Jagmohan, I currently live in Kansas, USA and about 99% of the recipes I have posted on this blog are cooked here(cooked and pictures taken). So all these ingredients are available in Indian stores here. yes, remember lahyya pitto very well from the festivals at our home. Did not know that it was ‘popped’ rice. Creative use of pop-corn. Hope your janmashtami was memorable. Shilpa: Still thinking what to post for Ganesh chaturthi. I had covered most of the things last year :).